This weekend, from Friday, February 8 to Sunday, February 10, features a reggae festival, Sleepless at The Music Center, new exhibitions at The Hammer, the second annual Forge Festival, a grooming competition for adoptable pets, and MUCH more. 1. One Love Cali Reggae Festival returns to the Queen Mary Events Park in Long Beach on February 8 – 10 for its fourth annual music fest with performances by Rebelution, Pepper, Slightly Stoopid and more. 2. The Pan African Film Festival (PAFF) returns to Los Angeles February 7-18. Now in its 27th year, the 12-day festival is the largest black film festival in America. 4. Saved By The Max, the Saved By The Bell Pop Up Shop Diner & Bar will transform into Malibu Sands & Zack’s Room as part of the “final semester” of the pop up expereince wrapping up in April. 5. 260LA will host a Diane von Furstenberg sample sale from February 5-10 in their Beverly Hills location. 6. Greenbar Distillery will open up their facility for a tour of their organic distillery. The tour allows guests to learn about the process of spirit making and taste some of Greenbar Distillery’s portfolio. Happening every Friday through Sunday of this month. 8. 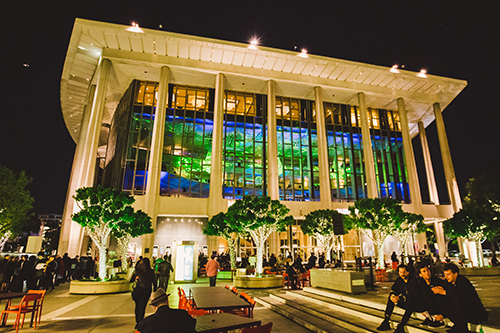 Sleepless: Quinceañera Reimagined happening at The Music Center’s Dorothy Chandler Pavilion in Downtown L.A. is an immersive late night multi-sensory party that re-imagines the Quinceañera focusing on rituals and symbols associated with the Latinx coming-of-age tradition. 9. The Chinese Chamber of Commerce presents the 120th Golden Dragon Parade in Chinatown. Just in time for Lunar New Year, the parade will include floats, marching bands, government officials, various dignitaries, entertainers, local business leaders and cultural groups. 11. Big Bud Press is hosting a one day sample sale at their headquarters in Glassell Park. Items will be deeply discounted and they’ll be giving away photo props and shelving items for free. 12. Descanso Gardens will host a Night Garden event fun for all ages with live music, food, educational talks, live insect viewings and shadow puppet theatre. 13.The 10th Annual Edwardian Ball takes over the historic Fonda Theatre for a night of whimsical live entertainment celebrating the beloved creations of the late, great author and illustrator Edward Gorey. 14. Angeleno parents can head to the Skirball Cultural Center for a Noah’s Ark After Dark pajama party this Saturday. 15. Cupid’s Undie Run happening at The Buffalo Club in Santa Monica is a “brief” run for a great cause. The event is around a mile run with plenty of partying in between. 16. Playful Los Angeles lifestyle brand ban.do will host a huge warehouse sale on Saturday and Sunday with up to 80% off accessories, shoes, stationery, jewelry, clothing and tons more. 17. The Autry Presents its 22nd Annual Masters of the American West Art exhibition and sale this Saturday featuring 64 western artist. Additionally the museum is hosting a trunk show with one-of-a-kind Native American jewelry, glass wall art, silver goods and more. 19. Severance Wine Bar wants to celebrate your single status during their BREAKUP BAR POPUP. Taking place next door to the bar, the two week long party will transport guest into an anti-Valentine’s Day world with break up appropriate movie screenings, a Wall of Broken Relationships, loads of champagne, cocktails and food. Running Tuesday through Saturday till February 14. 20. Cinespia presents a screening of Harold and Maude this Saturday at the Palace Theater. 21. The Hello Kitty Cafe Truck stops by the Burbank Town Center from 10 a.m. to 8 p.m. in the old IKEA lot across the street from Barnes & Noble. They’ll be serving lots of super cute treats while supplies last. 23. Celebrate the Year of the Pig at Universal Studios Hollywood starting this Saturday with some of your favorite characters. Check out Po’s Village and savor Asian delights at Mr. Ping’s Noodle Shop. Meet Illumination’s Minions in traditional Chinese attire and a Mandarin-speaking Megatron from TRANSFORMERS. The Lunar New Year pop-up will run till February 18. 24. Second Annual Adam’s Forge Festival celebrates the art of blacksmithing through live demonstrations, hands-on activities, musical performances, tomahawk throwing, artisan metal and craft marketplace and other family-friendly activities. 26. The monthly East LA Art Walk returns this month to highlight independent artists, muralists, crafters and local businesses from the Eastside and its surrounding neighborhoods. This event is put on by the East LA Business Association of the 1st St corridor and is designed to be family friendly. 27.Yoga at Angel City Brewery welcomes all levels of experience with a donation of $15-20 that includes a free drink at the end. 28. Molcajete Dominguero at LA Plaza de Cultura y Artes welcomes Angelenos to explore Latinx art, craft, clothing, food, and beverage vendors from Southern California this Sunday. 30. Hecho in LA and Smorgasburg LA will put on a Valentine’s Gift Mercado this Sunday. 31. LA’s adorable cat cafe Crumbs & Whiskers will host yoga this Sunday. Please bring your own mat and water for this one hour session. 33. Mojave Flea happening at Freehand will feature makers from Joshua Tree, Coachella Valley and beyond. Vendors will offer handcrafted food, drink, jewelry, apparel, accessories, apothecary, housewares, furnishings, curated vintage and more. Entry is free. Due to rain in the forecast, this event has been rescheduled to February 24. Severance Wine Bar on Melrose Ave will host an unofficial GRAMMY Awards Champagne Viewing Party this Sunday starting at 5 p.m. The evening will feature themed cocktails, winner prediction contests with prizes, and live viewing on a 125-inch projected screen. Cocktail highlights include INVASION OF PRIVACY inspired by Cardi B made of Amontillado Sherry, Orange & Angostura Bitters, lemon, Luxardo syrup and Pommeau; SCORPION inspired by Drake made of Cava Reserva, Amontillado Sherry, Pistachio Orgeat, lime and mint. Severance Wine Bar is located at 7274 Melrose Avenue, Los Angeles 90046.